Athens is one of the most famous capital cities in Europe thanks to its blockbuster ancient history. But what else is there to see except the Acropolis? Why stay longer? I’m happy to see Athens becoming increasingly popular as a tourist destination in its own right rather than just a transit point for reaching the Greek islands. And rightly so. I have an enduring love affair with Athens—it’s my favourite city and I lived there for the best part of a year. Here’s how not to do Athens: fly in, spend one sweaty morning rushing up the Acropolis, leave on the next ferry/flight to Santorini. There’s so much more to this vibrant and rewarding city than that. It was difficult to even whittle this down to 15, but here are the top things I recommend to see, eat and do whilst you’re in Athens. Acropolis and the Acropolis Museum. 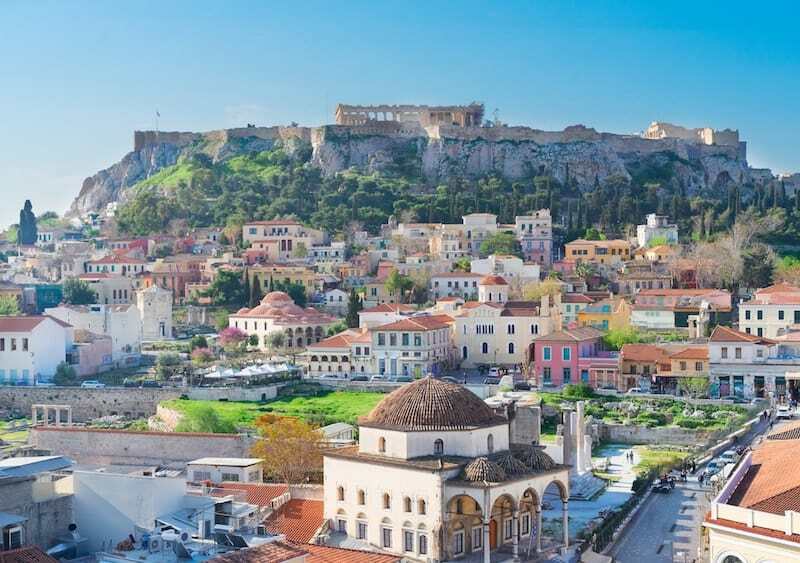 Considered the birthplace of Western Civilisation and most famous historic site in Greece, the Acropolis is the one site you won’t want to leave Athens without seeing. The archaeological site, which includes the Parthenon as well as other ruins. Note that the (excellent) museum requires a separate ticket. * Don’t miss the Odeon of Herodes Atticus, an impressive amphitheatre on the southwest slope which still hosts concerts for up to 5000 people. Explore Plaka. 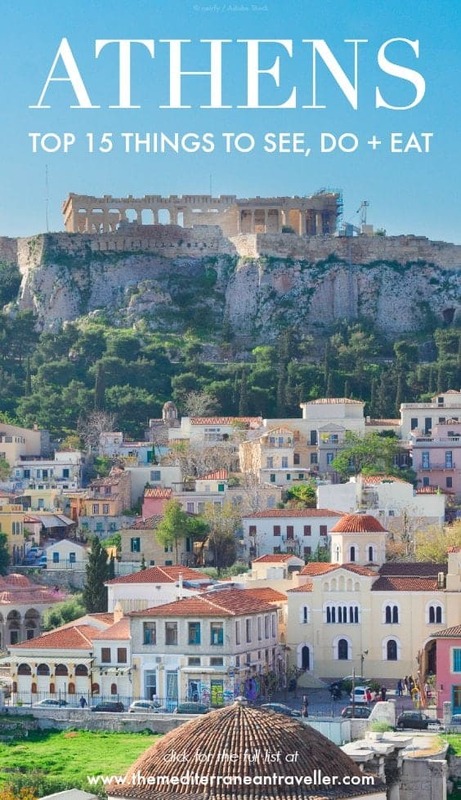 This is the ‘pretty and old’ bit of Athens with its manicured streets and neoclassical buildings, Plaka is to the north of the Acropolis and the best part of town to walk around if you only have a short time. It is full of tourist shops and restaurants. I love the cafes around the Plaka Stairs on Mnisikleous Street. Panathenaic Stadium. On the site of an ancient stadium, this marble monument was built in 1896 for the first modern Olympics and is still where the flame starts its journey today. The tracks are open for morning jogging until 9 am, but even if running isn’t your thing you can stand on the famous podium for a moment of Insta-glory. Changing of the Guards. Watching the hourly Changing of the Guards at the Tomb of the Unknown Soldier is a ritual for first-time visitors to Athens. It takes place at the Parliament Building just on Syntagma Square. Don’t miss the nearby National Gardens whilst you’re there. Benaki Museum. As you might expect from such an ancient city, Athens has a lot of really great museums. The National Archaeological Museum is the other biggie (in a literal sense too, it has more than 11000 exhibits). But you’re bound to find something that interests you at one of the Benaki Museum‘s seven sites across the city. The main building in upmarket Kolonaki focuses on Greek art and culture and has a classy rooftop cafe. *The Acropolis is not the only archaeological site in Athens; they’re scattered around the centre of town. You can buy a combined ticket for entrance to all, but quite honestly, I don’t recommend this unless you’re a dedicated ancient history super-nerd. You will get ruin fatigue and you can see most sites from the streets as you’re walking around. 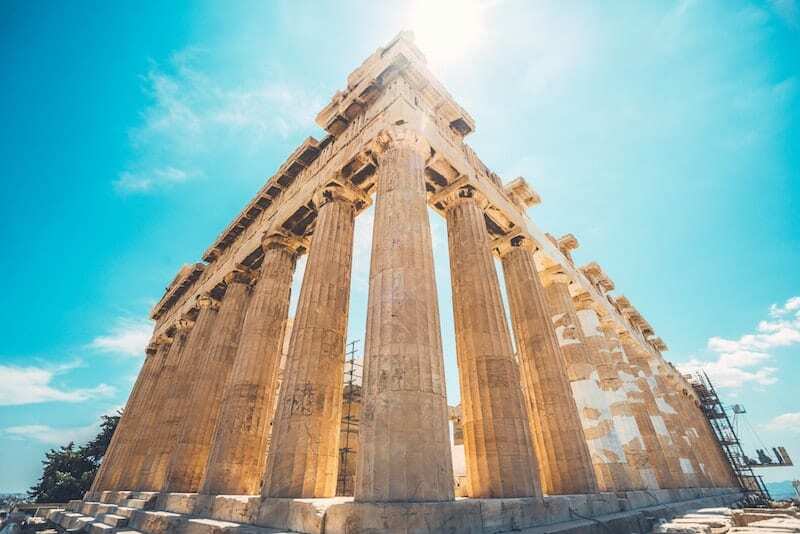 Keep an eye out for the Temple of Hephaestus (one of the best preserved classical temples), the Ancient Agora, the Roman Agora and Tower of the Winds, Hadrian’s Arch, and the Temple of Olympian Zeus. Explore Anafiotika. A little slice of the Cyclades hidden between Plaka and the Acropolis, the neighbourhood of Anafiotika was built by construction workers from Anafi in the traditional architectural style of their home island. It’s not the easiest place to find (it took me 3 attempts) but feels a world away from the chaos of the city. Picnic on Filopappou Hill. Athens has a number of hills which provide great panoramas over the city and out to sea. Filopappou Hill is both my favourite and the easiest to reach: it’s gentle and central but great for photographing the Acropolis. Take a picnic or cold beers up for sunset. Take a street art tour. A walking tour is a great way to learn about the complex modern history of Athens as well as take in some of the city’s amazing street art and alternative neighbourhoods. If you don’t want to take a tour then wander around Psyrri, one of Athens’ most picturesque neighbourhoods with its mix of cobbles, cafes, abandoned buildings, and street art. Open air cinema. Athens is a memorable place to catch a movie thanks to its many open-air cinemas. In the summer you’ll find everything from modern family films to arty classics across the city. For ambience though, Cine Paris and Cine Thesion both have Acropolis views which pair perfectly with a cold beer. Hit the beach. No need to wait until you’re in the islands for a beach day! 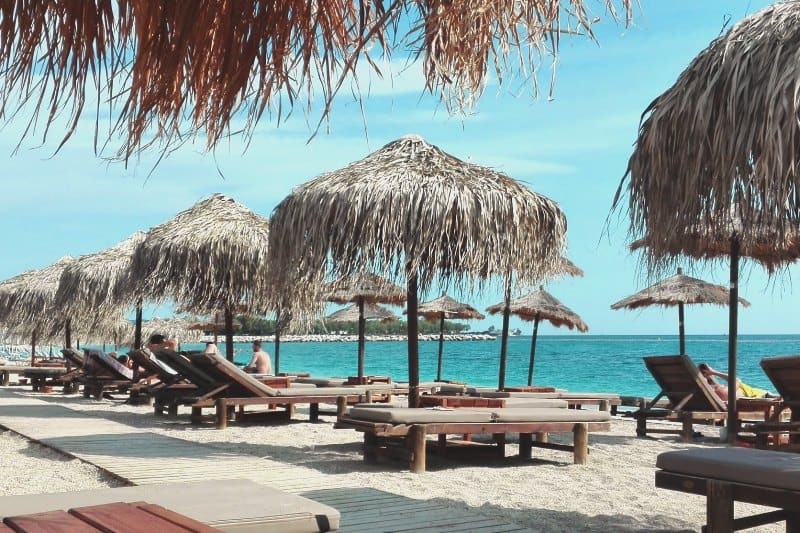 Many tourists don’t know about the Athenian Riveria and but simply take the tram down the coast and hop off at one of Athen’s swanky beach clubs (Bolivar and Balux are my faves) for a day in the sun. Rooftop Cocktails. One of the best things about summer in Athens is sipping a cocktail on a roof terrace bar as the sun goes down and the city lights ups. In fact, a rooftop view of the Acropolis is arguably more enjoyable than climbing the ancient site itself. Not least if the bar serves innovative cocktails made with Greek ingredients. A is for Athens, Couleur Locale, and Galaxy are the classics, although new ones pop up all the time. Loukoumades. Those with a sweet tooth will not be disappointed in Athens. Check out Lukumades on Aiolou Street for these deep-fried doughnut balls drenched in sticky honey and topped with ice-cream. Wash it down with a cold freddo cappuccino, the Greek coffee of choice in hot weather. Greek wine. Unless you’re Greek or a wine buff you probably haven’t tried Greek wine before, which makes it all the more exciting to get acquainted with the local varieties. Athens has an increasing number of wine bars that will introduce you to Greek wine; Winepoint, Heteroclito, Zampano and Cinque are just a few to get you started. Souvlaki. If Athens is your first stop in Greece then it won’t be long before you come across your first souvlaki pita, the national street food staple. Chunks of meat grilled on a stick (the souvlaki), served in a pita wrap with tomatoes, tzatziki, and often some salty fries. Kosta’s is widely regarded as the best in the city, just make sure to get there early as it closes at 3 pm. Make the most of it; you’ll miss it when you’re home (trust me). Central Food Market. Also known as Varvakios Agora, this market is still very much a traditional experience. Its vast indoor butchery and fish halls are not for the faint-hearted. Poke around the market and the shops in its surrounding streets selling spices, sausages, and knick-knacks to find something for lunch. I recommend taking a food tour if you want to dig dip into Athenian food culture.